RETREATS – Why we retreat? So we can step deeply into the work, thereby creating a healing experience that lives in our bones. 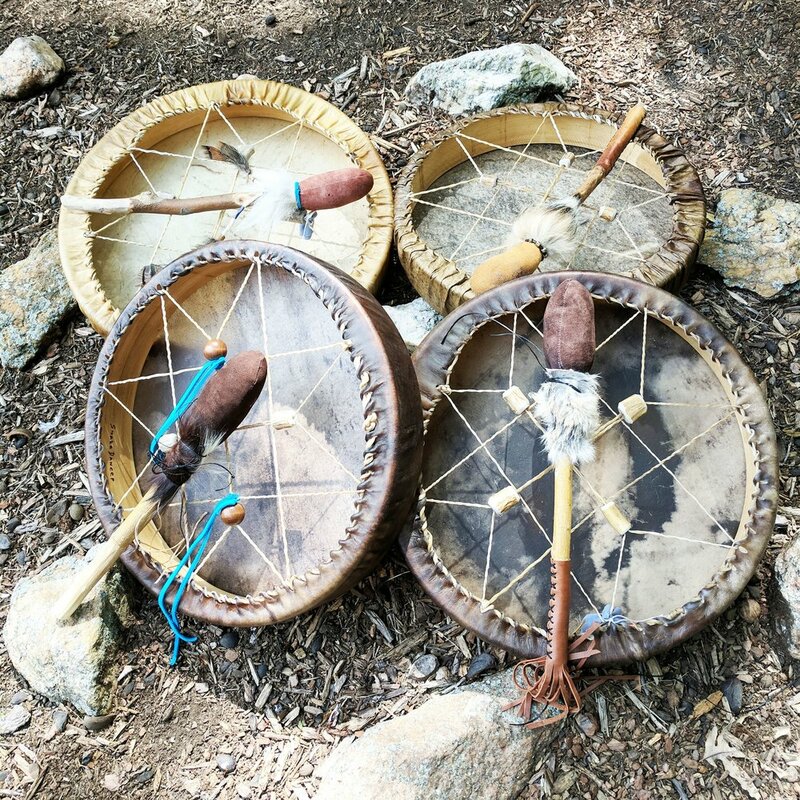 Drum Birthing Retreat (a one-day format is also available) – A drum is a powerful medicine or ceremonial tool, and it can be used for honoring the Great Spirit (my word not necessarily yours), healing, clearing and generating energy. During a weekend retreat, we will use the shamanic technique of dreaming and journeying to connect with Spirit, and our higher selves, to bond deeply with our new drums. I will teach you the simple process to deliver into being your round 16" Elk, Horse, Buffalo, Deer, Cow or Moose skin shaman/frame drum, Sacred Medicine Wheel Drum and a beautiful beater. Other sizes are available. The eight-pointed star lacing pattern we use to hold the skin on a beautiful Canadian cedar frame, was provided to Snake Dancer in a vision. It is a powerful symbol that invites your heart to open to the energies of the ancient Medicine Wheel. It is possible in the process of birthing your drum to experience a deep, personal transformation and an initiatory type of integration of your personal power. Five Day Intensive Retreat – This intensive five-day retreat is offered to retreat and wellness centers all over the planet. We will birth a drum in the manner previously described. During our extended time together, you will learn how to use your new sacred tool to shift consciousness, honor Spirit, and increase your intuition. You will learn ways to use the energy of the drum, the power of intention, and your sacred connection with Spirit, to empower yourself, your family, and your community. We will also focus some time on the dynamics of forming your own sacred circles in your community. Personalized Healing Retreat or Vision Quest – Contact Cyndy to design this opportunity based upon your individual needs. WORKSHOPS – All of these workshops (an interesting word for a spiritual circle) have a shamanic feel, in that we connect with the elements, the Earth Mother, and all of her creature teachers, to inspire and deepen our experience. Self-Healing Through Shamanic Journey – This experience is a prerequisite to entering the one-year shamanic apprenticeship. As you follow the heartbeat of the drum, we will explore the techniques to enter the Shamanic state of consciousness, to seek guidance, insight and healing. As humans all over the Earth have done for millennia, we will journey to remember our connection to the Earth and all of her creatures. Journeying is an excellent way to renew your relationship with Spirit and your own soul's gifts as well as strengthen the power of your intuition. Sacred Rattle Making – This two-day process (on two separate weekend days) offers you an opportunity to make a rawhide rattle in the way of the shaman. Patterns that I have created are Bear, Buffalo, Wolf Howling at the Moon, Butterfly, Heart, Arrow, Eternal Flame, Full Moon, Crescent Moon and Snake. Through shamanic journey experiences you will gain insight into how this tool might be used. Sacred Crafting – During this one-day experience, we will do ceremony, vision our projects, create strategies for success, laugh, eat and celebrate the beauty that unfolds from our hands and hearts. Bring your unfinished drum or rattle, or whatever else is lying around, and we will finish them together. I can help you create a medicine bag, a drum beater, or prayer feather. Some folks want to start their rattles, but know that this process requires 2 separate days. Sound Healing or Sound Bath – During this one day experience we will explore the principles, efficacy and healing potential of intentionally created sound. However, during the majority of our time together, you will simply relax and receive a continuous flow of loving vibrations emanating from powerful sound healing tools. Some have expressed that they felt deep peace and connection during this experience. How To Create And Live The Medicine Wheel – During this one-day workshop we will build a Medicine Wheel on your land in the way taught by the late Sun Bear, a powerful Chippewa elder. The Medicine Wheel is a tool for living your life consciously, in connection with the elements, animals, plant beings, and stone people of the Earth. Deep personal lessons are available to inspire us when we focus our intention on each of the 36 stones that comprise the wheel. The wheel calls our attention to the changing of the seasons and all that each cycle has to offer us. It is an extraordinary family and community tool for increasing personal and planetary awareness. CIRCLES – Why we circle? Folks have circled since time out of mind. Circles represent oneness, unity, harmony and balance. We hold love in the center of our circles. All traditions are welcome! Drum Circle – We are inspired by the teachings of the Medicine Wheel while we use various forms of vibration, such as simple drum rhythms, rattles, Native American ceremony, and simple sacred dance movements, to create a shift in our consciousness. This shift creates a still place where clarity and insight can be profoundly felt. Out of this place of higher vibration, personal healing and a sense of unity with Spirit can be achieved. This circle is more contemplative and shamanic than musical. All are welcome! Shamanic Journey Circle – Journeying can serve as a powerful support for the many experiences we go through in our lives. As you follow the heartbeat of the drum, you will learn how to enter the shamanic state of consciousness to seek guidance, insight, and healing. As humans all over the Earth have done for millennia, we will journey to remember our connection to the Earth and all her creatures. Journeying is an excellent way to renew your relationship with Spirit and your own soul's gifts as well as strengthen the power of your intuition. Sound Healing Circle Ceremony – You will sit or lie in a relaxed position while listening to me (and perhaps others) play various instruments. While playing or singing, we will hold a loving intent for your well-being. There will be an opportunity to share if you wish. Some have shared that they experienced very profound peace and relaxation. We know that loving and intentionally created sound never dies and travels not only to the center of our bones, but beyond our circle to the very core of the Earth Mother. Sacred Pipe Circle Ceremony – This is a native way to pray. No mind altering plant medicine is smoked in the pipe - just sacred herbs called Kinnikinnick. Circle of Stones (A one-year shamanic apprenticeship) – This is an ongoing monthly circle where we gather to explore the medicine wheel from a shamanic perspective. A commitment is required and the circle opens in March and September. All details can be found here under The Medicine Wheel and The Shamanic Apprenticeship sections of the website.